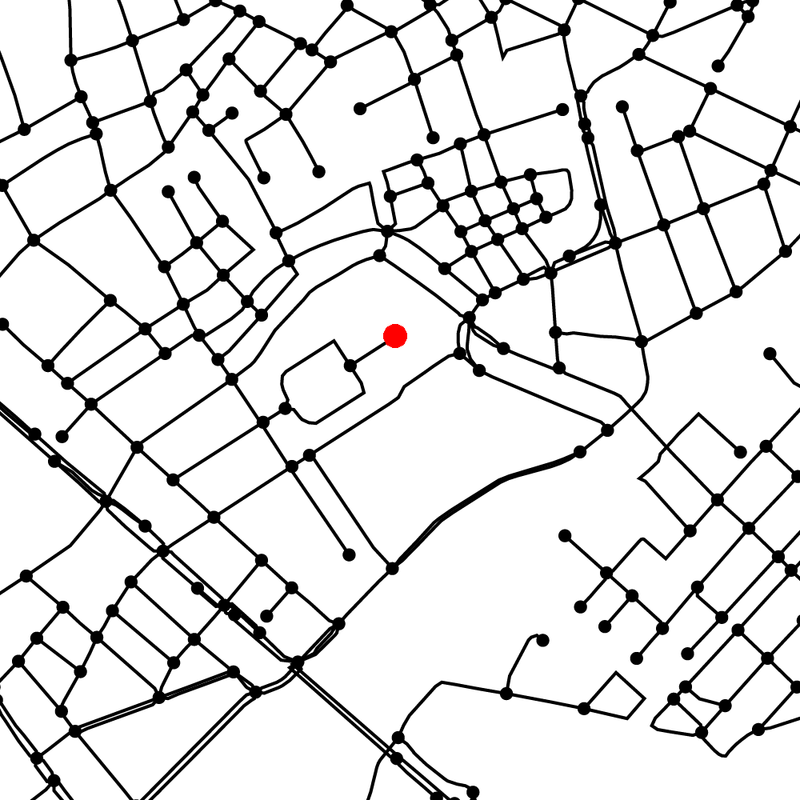 The input data set to the art are all the roads in the world, as obtained from Open Street Map. Road segments between intersections are represented by polylines and ends at intersections are snapped together to coincide with a resolution of 5–10 meters. There are 108,366,429 polylines and together they span about 39,930,000 km. 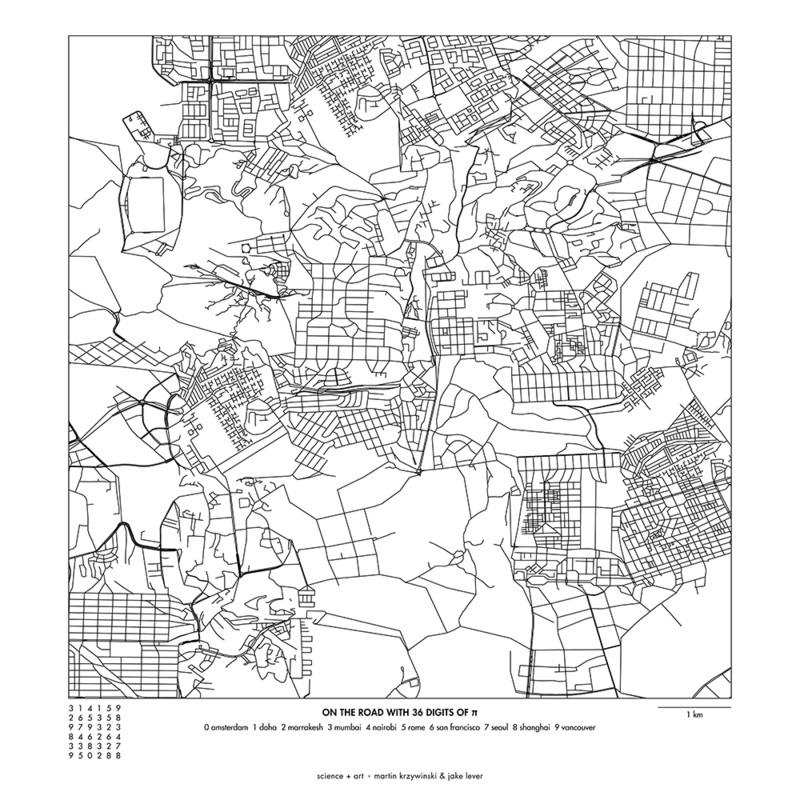 We took 44 cities and sampled a square patch of 0.6 × 0.6 degrees of roads from the data set centered on the longitude and latitude coordinates below. This roughly corresponds to a square of 65 km × 65 km. These center coordinates might be slightly different from the canonical ones associated with a city—I used Google Maps to center the coordinates on what I felt was a useful center for sampling streets. Below are these coordinates along with the number of polylines extracted. where `\phi` is the latitude and `\lambda` is the longitude. The average is taken over the patch of roads extracted for the city. For all steps below these transformed coordinates were used. 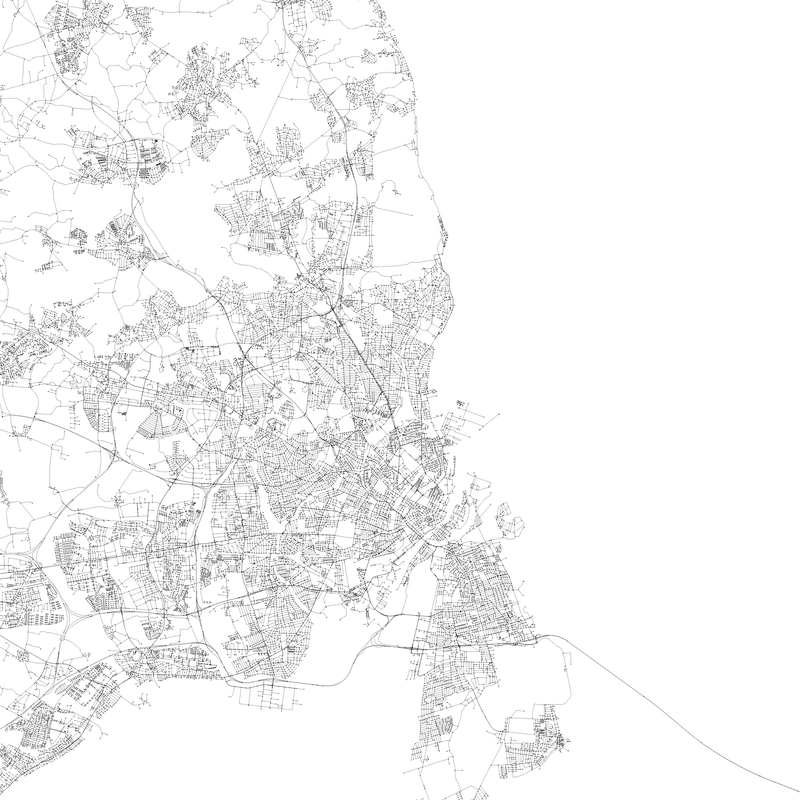 Let's look at one city—Copenhagen—to get a feel for the data set. In the zoom crop below, you can see the intersections (dots) and the individual polylines that connect the intersections. Zooming in even more you can see the Christiansborg Slot, one of the Danish Palaces and the seat of the Danish Parliament (corresponding Google Map view). City strips were created by sampling patches of 0.015 × 0.015 degrees (after transformation). This corresponds roughly to 1.7 km. For each position in the strip, patches were sampled in order of the digits of `\pi` only if the number of polylines in the was `40d \le N < 40(d+1)-1` where `d` is the digit of `\pi`. Patches for `d=9` only need to have `360 \le N` polylines. For example, the first patch is assigned to `d=3` and it must have `120 \le N < 159` polylines. The second patch is sampled so that its density is `40 \le N < 79` because it is associated with the next digit, `d=1`. 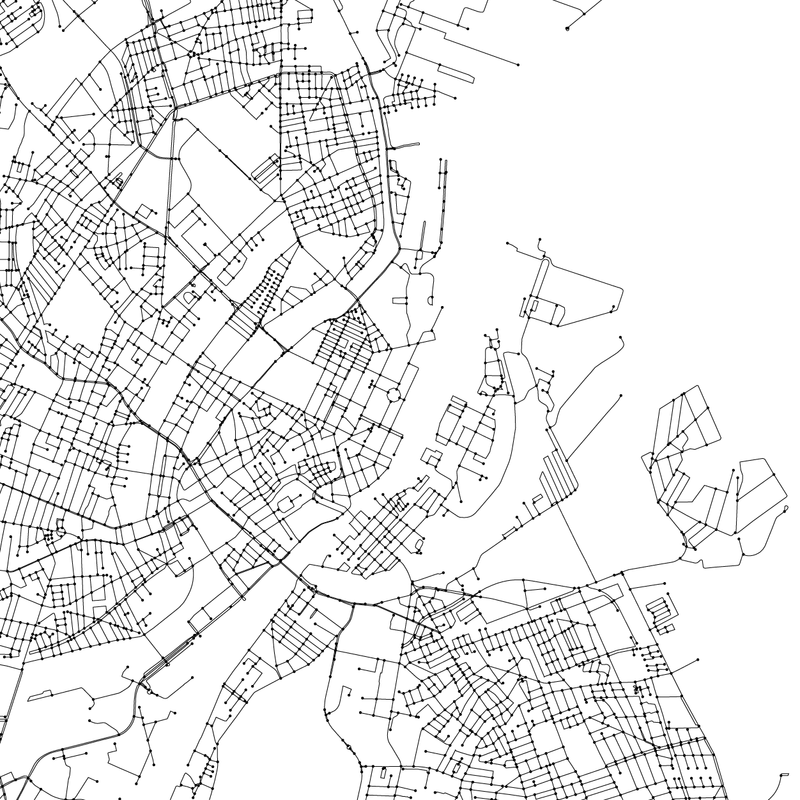 Further selection on acceptable patches is performed so that the streets line up with the previous patch. Minor local adjustments and stitching are performed to make the join appear seamless. Below is an example of a set of city strips for Amsterdam, Bangkok, Beijing, Berlin, Copenhagen, Edinburgh, Hong Kong, Johannesburg, Marrakesh and Melbourne. Below I zoom in on a portion of the city strips above to show the result of the stitching—individual street patches are outlined in blue squares. ▲ Close-up of stitched streets in a city strip. It's interesting to see that some patches (e.g. 4th one on the bottom strip, which is Copenhagen) don't necessarily have roads that across the patch horizontally. World patches are a two-dimension version of city strips but they use more than one city. 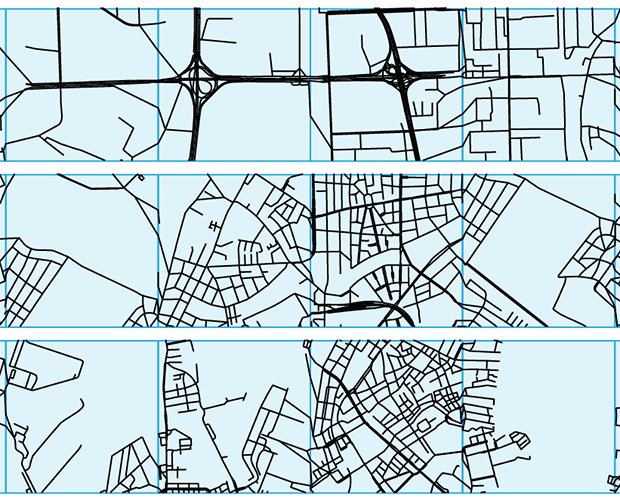 Patches are sampled from cities based on the order of the digits of `\pi`, as arranged on a 6 × 6 grid. For example, the first row of patches corresponds to 314159 and the second 265358. 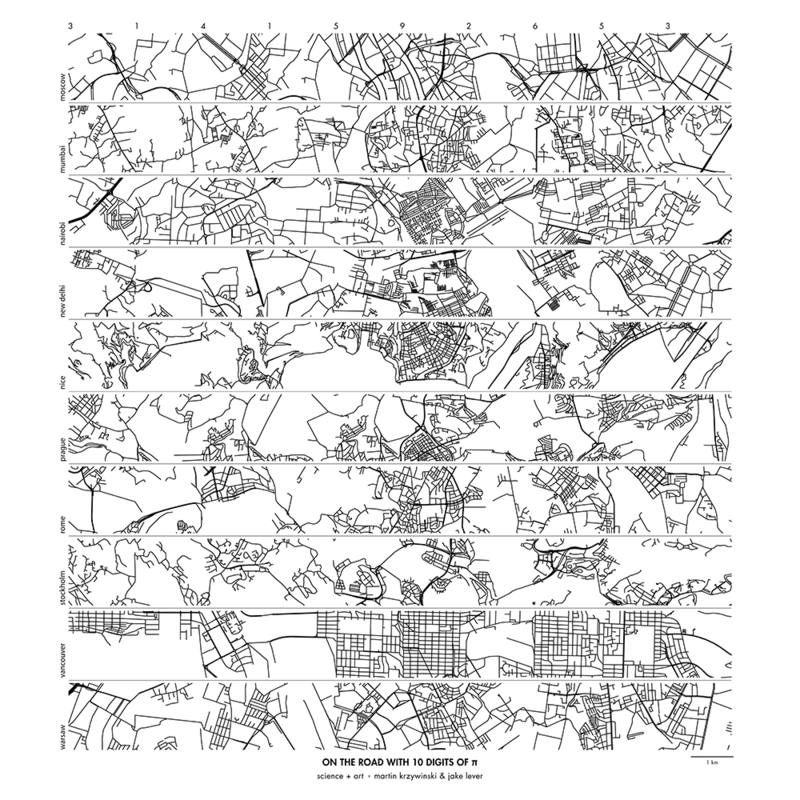 Each digit is assigned to a city from which the corresponding patch is sampled. As for city strips, patches are selected only if they align with previous patches. This is now trickier to do in two-dimensions because we must match a selected patch with up to two other patches already placed. Unlike for city strips, there is no selection made for street density. 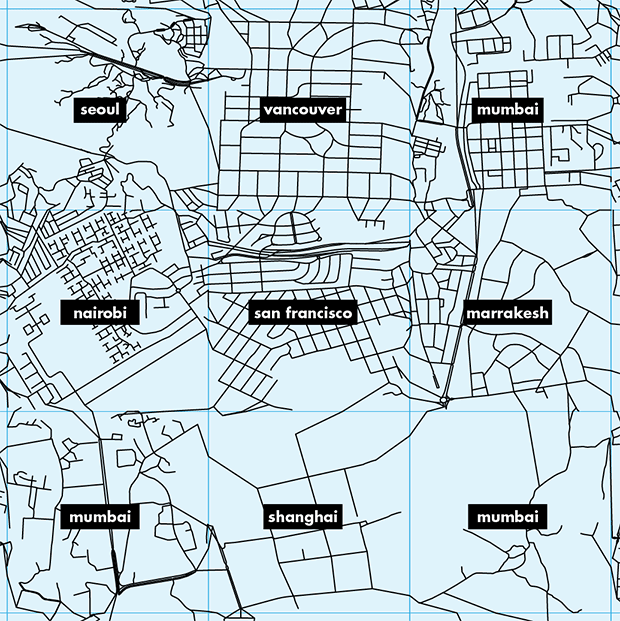 Below is a world patch using the following digit-to-city assignment: 0:Amsterdam, 1:Doha, 2:Marrakesh, 3:Mumbai, 4:Nairobi, 5:Rome, 6:San Francisco, 7:Seoul, 8:Shanghai and 9:Vancouver. Below I zoom in on patches in the center of the image and show the cities from which the patches were sampled. ▲ Close-up of stitched streets in a world patch.